TRAGIC: Some of the dogs seized and (inset) the German Shepherd that had to be put down. 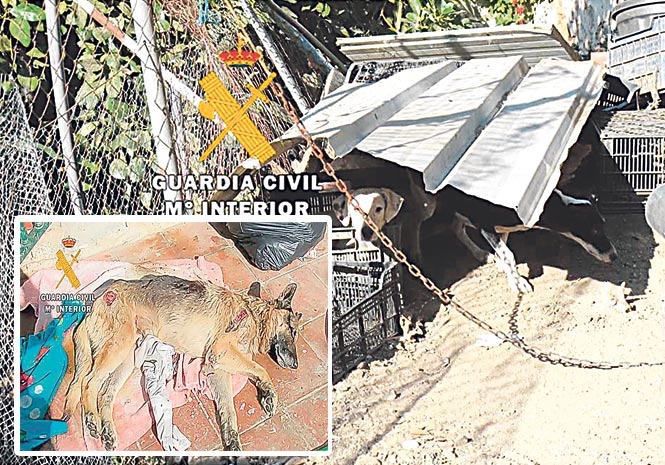 THREE people have been held after the Guardia Civil swooped to rescue 38 starving dogs. The raid comes in the wake of a probe sparked when a concerned Benajarafe resident reported a suspected case of animal cruelty. Investigators visited the supplied address and found an eight-year-old German Shepherd suffering from malnutrition plus a series of infected wounds. The dog was infested with parasites including ticks, maggots and worms and was lying in its own excretement. Having quizzed the owner it transpired that the animal had been ill for at least 15 days and had not received any veterinary treatment. It was taken to a nearby animal shelter and put down. Meanwhile a separate investigation led detectives to a Torrox farmhouse housing 30 dogs of several breeds being kept in unhygienic conditions and showing signs of abandonment. An additional seven dogs – five of which were being kept in two small enclosures in which the ground was covered in excretement – were found on a second farm in Torrox. The other two were loose on the property but all were suffering from severe malnutrition, and one appeared to have had part of a leg amputated in a non-surgical procedure. Could the Animal Shelter not put down the Animal that lead to these poor dogs suffering the way they did?